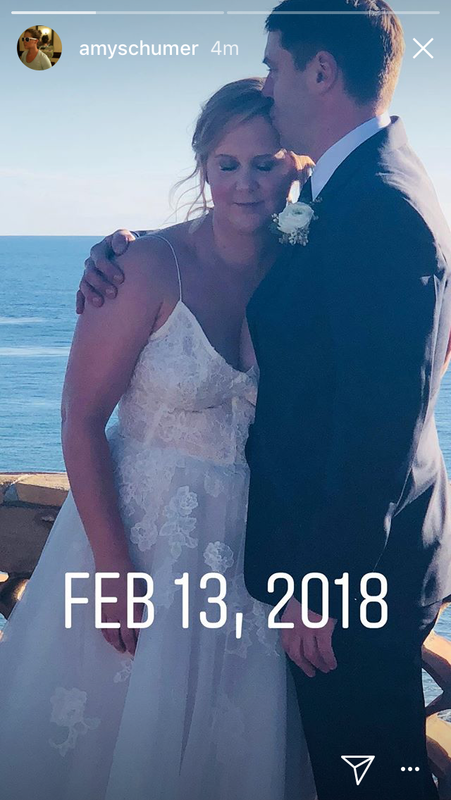 Reports have been swirling that Amy Schumer secretly got hitched to her chef-beau Chris Fischer at a low-key wedding in Malibu, California. Turns out that it’s not a rumor after all: The comedian uploaded a photo album from the wedding to Instagram early this morning captioned with a simple “Yup.” Schumer wore a flowing white, strappy gown to the sunset wedding and is glowing in these snaps from the ceremony. Her sister Kim Caramele and another friend acted as bridesmaids, comedian John Early officiated, and Schumer’s bff Jennifer Lawrence was in attendance as well (wearing a delicate pink gown with black banding at the waist). Even Schumer’s dogs walked down the aisle with her. Awww. Schumer later responded to shotgun wedding rumors with an Instagram post where she joked that she was “not pregnant.” And apparently friends and fans have already reached out about sending her a wedding gift, to which she asked that, in lieu of gifts, people make a donation to Everytown for Gun Safety, a non-profit that advocates for gun control. A “source” told People.com that the ceremony was held on Tuesday, February 13th, 2018, and that Jennifer Anison reportedly attended. 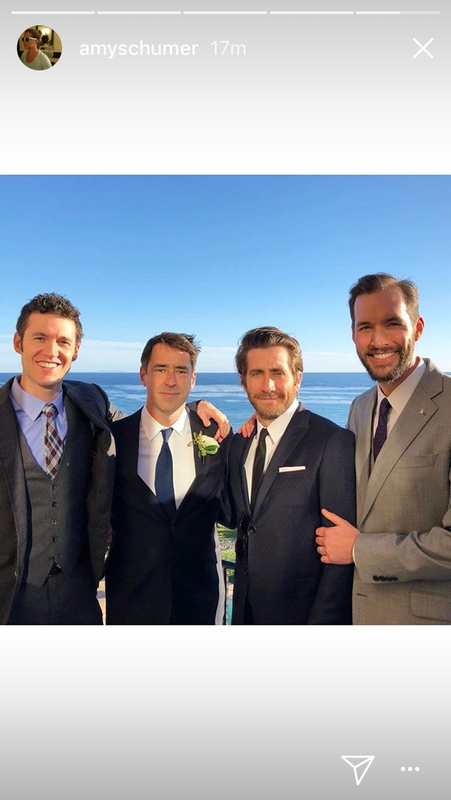 While Schumer hasn’t (yet) shared any photos that prove Aniston was there, she did post wedding guest photos, and some of the famous faces in attendance included Jake Gyllenhaal, Chelsea Handler, Larry David and his daughter Cazzie, and comediennes Bridget Everett and Rachel Feinstein. This wedding announcement comes as a shock to everyone who didn’t even know she and Fischer were dating until three days ago — when she posted a kissing photo with her now-husband at Ellen DeGeneres’ birthday party. Schumer’s husband may not be a household name but he’s a James Beard Award-winning cookbook author, the head chef at New England restaurant Beach Plum (the Obamas are fans), and has worked at Mario Batali’s iconic New York restaurant, Babbo. Congratulations to the happy couple. Here’s hoping that Amy will dish on her wedding and marriage in her next stand-up special.